Professor Anil Pradhan addressing at the National Science Day program. 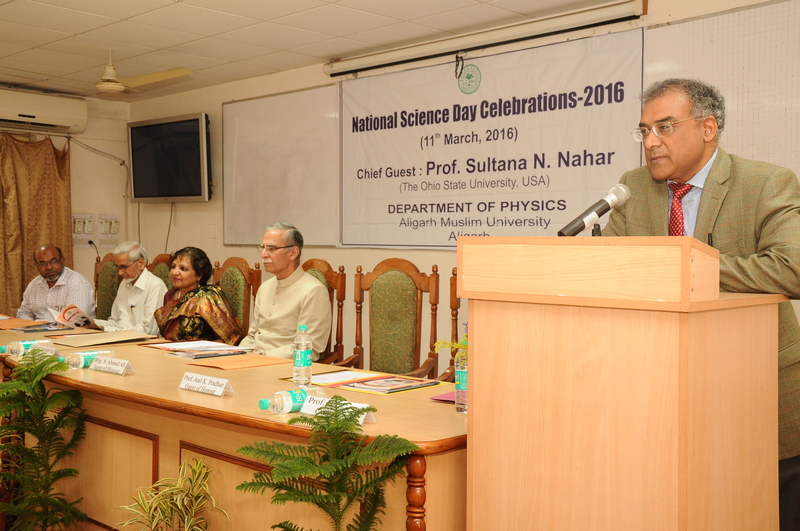 ALIGARH- To mark the discovery of the ‘Raman Effect’, the Department of Physics, Aligarh Muslim University today observed the ‘National Science Day-2016’ celebration, which was attended by Ohio State University Professors as the Chief Guest and Guest of Honor. 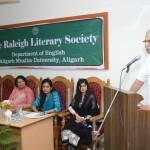 AMU Vice Chancellor, Lt. Gen. Zameer Uddin Shah (retd.) presided over the function. While attending the function as the Chief Guest, Professor Sultana N Nahar, APS fellow and research professor, department of Astronomy, Ohio State University, USA urged students, scholars and teachers attending the function to give extra efforts for reaching the bar of excellence. She said that it is imperative to bring our knowledge to the public and always support students and scholars, who are doing constructive things. She further said that we, as scientists, should remember that we will always be known for our constructive work and trusts we leave behind for others to benefit. 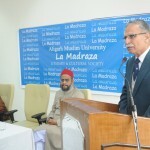 AMU Vice Chancellor, Lt. Gen. Zameer Uddin Shah (retd. ), in his presidential address, said that our available funds can keep on increasing, if our teachers continue to bring projects to the university. He added that it is well under the capabilities of our teachers and scholars to bring the best for the university. He added that the recent U S News Education survey has given AMU, the second rank in the Indian universities and we have to live up to the expectations to reach the number one spot. The Vice Chancellor also pointed out that since Independence, AMU along with Delhi University and Banaras Hindu University has been in the top institutions of the country and our teachers, students and scholars have to work accordingly with the University’s reputation. The Guest of Honor, Prof Anil K Pradhan from the Ohio State University’s Department of Astronomy said that AMU has produced scientists like Prof M S Z Chaghtai, who continue to inspire scientists all over India and the world. 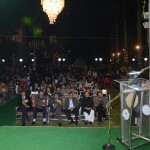 He urged the students and teachers of the AMU’s Department of Physics to follow footsteps of the great scientists, who have attended AMU and make efforts for pioneering innovations in physics. 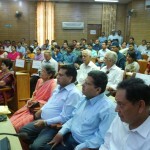 In the welcome address, Prof M Afzal Ansari, Chairperson, Department of Physics said that the Department has an illustrious legacy and continuous stride in academic excellence with acknowledgement from the University Grants Commission, New Delhi and Department of Science and Technology, New Delhi, resulting in the endowment of financial assistances through schemes such as DRS, DSA phases I, II & III, COSIST, FIST and PURSE. While conducting the program, the convener of the program, Prof B P Singh, said that the National Science Day is celebrated in India each year to mark the discovery of the ‘Raman Effect’ by Indian physicist Sir Chandrasekhara Venkata Raman, for which he won the Nobel Prize in Physics in 1930. Prof Singh added that this day is celebrated to widely spread a message about the significance of scientific applications in the daily life of the people and to display all the activities, efforts and achievements in the field of science for human welfare. The Vice Chancellor and Dean Faculty of Science, Prof Abdul Muneer with the Chief Guest and the Guest of Honour distributed ‘Academic Distinction’ awards and other awards to teachers, students, research scholars and the supporting staff. Prof Tauheed Ahmad received the S N Nahar Distinguished Teacher of the Year Award. Prof Shabbir Ahmad and Dr Nasra Neelofer received the S N Nahar Teacher of the year awards. Dr Mohammad Jane Alam and Dr Lila Abdalaziz Aid Al-Khataby received the Alburuj R Rahman best PhD thesis prizes. Ms Fozia and Mr Sajad Ahmad Sheikh bagged the S N Nahar Best Student prizes. Ms Ashna Zainab and Mr Ishfaq Ahmad Rather received the Alumni awards. Ms Samiya Manzoor won first prize in the Research Scholars’s Best Presentation Award, while Mr Sofi Suhail Majid and Mr Mohammad Shuaib stood second and third respectively. Ms Ankita Saxena and Ms Farhana Zaidi won the consolation prizes. Supporting staff members Mr Soban Ali, Mr Mushaffar Ali, Mr Zulfiqar Ahmad and Mr Zeeshan Fazal were also awarded for their performances. 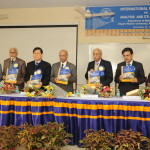 The Vice Chancellor with the guests also released ‘Physics Bulletin’ and the ‘Annual Report’ of the Department of Physics.